I saw an adapted version of these on Courtney's blog, and she raved about them so much I knew I had to try them. I love cake batter, so what could be better than cake batter blondies (aka white brownies)? These were super tasty, but I wasn't crazy about the texture. I'm definitely a "texture" person. I love the flavors of kiwis, blueberries and raisins, but I can't eat them unless they're mixed into something. Something about the texture gives me the shivers. I don't get it. I'm completely weird. It makes no sense. I accept this. *Preheat oven to 350 degrees. Prepare pudding. 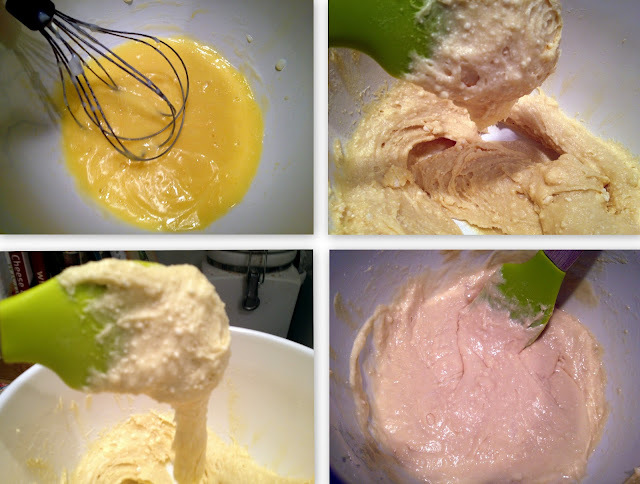 *In a small bowl whisk together egg substitute, oil, and pudding. Add cake mix to the wet mixture and combine (batter will be very thick). Slowly add the milk and stir until just combined. Optional: add some sprinkles to the mix! *Place batter in an 8×8 pan sprayed with nonstick cooking spray. Bake for 22-25 minutes or just until the edges turn golden. *Allow to cool completely (at least 30 minutes) before cutting – the center will otherwise be pretty gooey! Pudding + egg + oil...Showing you thick batter...batter ready for pouring!